A lot of components in Ignition accept HTML. Using some basic HTML can really step up your project to a new level. Open the Ignition Designer and drag the Label component from the Display tab of the Component Palette. The label now has two lines. Open the Ignition Designer and drag the Button component from the Buttons tab of the Component Palette. Open the client (runtime) and hover your mouse over the component to see the tooltip. Open the Ignition Designer and drag the Table component from the Tables tab of the Component Palette. In the Property Editor, check the checkbox on the Test Data property to fill in some test data. To change the table's header we need to use the Table Customizer. Right click on the table and select Customizers > Table Customizer. 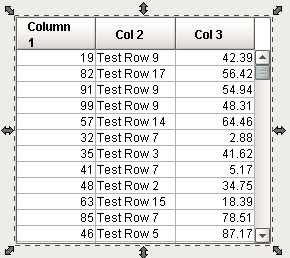 Now the table's header has multiple lines. Feel free to experiment with other components to see if they accept HTML. You can combine HTML and the use of icons to really make your project stand out. As always, if you have any questions please feel free to call or email us.